. ببساطة كل الخدمات وأساليب الضيافة التي تشتهر بها The Boutique Collection تجعلك تشعر وكأنك في بيتك. يقدم هذا الفندق العديد من الخدمات الكفيلة بإرضاء أكثر الضيوف تطلباً. لقد جهزت هذه الإقامة الفندقية بعناية فائقة لتوفر مستوى عالي من الراحة. في بعض الغرف يجد النزيل تلفزيون بشاشة مسطحة, اتصال لاسلكي بالإنترنت, مسبح خاص, حوض الاسترخاء, غرف لغير المدخنين. يقدم الفندق العديد من الفرص للاستجمام كمثل حوض استحمام ساخن, شاطئ خاص, مركز للياقة البدنية, حمام سباحة خارجي, سبا. إن The Boutique Collection Private Apartments at Sea هو خيارك لخدمة الفنادق الراقية في المدينة. يُرجى العلم بأنه يتم توفير خدمة الغرف مرة واحدة فقط كل 8 أيام. ويمكن الاتفاق على توفير خدمة الغرف بمعدلات إضافية أثناء مدة الإقامة مقابل 40 دولارًا أستراليًا. Palm cove is a little piece of paradise. Accommodation matched the location. Studio room was comfy with great balcony. Not real keen on semi see through glass to bathroom but only minor thing. Overall wonderful room in fantastic resort in stunning location. We were extremely disappointed that despite advice to the contrary we were unable to contact any staff member before or after 6,00pm. Luckily it wasn't an emergency otherwise we would have been really stuck as we were unable to contact anyone via mobile or landline. The TV should have been checked beforehand as it took as considerable time and frustration to get it working. The internal drying line was broken and an airing rack that was promised never arrived. Crockery and cutlery was very basic and limited, eg 1 dinner plate and no sharp knife. We wouldn't recommend the apartment to others. There were a couple of problems w my room. The bath tap did not work, one of the buttons flushing the toilet did not work and at the end, you need to wash your dishes (but w no detergent supplied). These are minor, but notable, issues that I would prefer not to deal w, when on holiday. This resort was beautiful and very relaxing, had to get up early though to get a good spot by the pool. Walking distance to the main strip of shops and our particular room didn't have a sufficient air con system, but in all a very pleasant staying experience. 3 Nights stayed, very good apartment and location is perfect, kids love swimming pool. This is my second stay at Sea Temple and I would recommend it to those who are travelling to Cairns. There is a children friendly pool and good options for dining and a pool side bar. I would highly recommend the resort for anyone looking for a very relaxing escape. Delightful. Would definitely recommend. hotel was great. They just need to make better coffee! Bit of a pain that the Sea Temple reception couldn't check us in as we booked through the Boutique apartments and we had to wait for Bianca ( very helpful) to arrive and show us around. We couldn't leave the key at reception on our morning walks or leave our bags in their care at checkout as it wasn't their responsibility. After check out we thought a mobile phone had been left behind. Once again the Sea Temple couldn't look after us as even though it was a room in the establishment. Talk around the pool was "why were tradesman grinding tiles and high pressure hosing the hotel not only on the weekend but on school holidays - all school are back at school next week - do it then ! the stay was good. You must realise whilst you stay at the sea temple, you are not part of it, so you dont use reception for anything. The rooms are serviced either, so if that is important then book at the sea temple, otherwise for a cheaper stay, with all the inclusions of a really nice hotel, book here. in winter water can be too cold for the kids to swim. The Boutique Collection is part of the Sea Temple resort, but is just managed privately. You have full access to all the Sea Temple facilities. My husband and I stayed here over Easter in a two bedroom apartment. As we arrived late the keys were left out for us. The apartment was lovely and spacious with a full kitchen. We cooked dinner a few nights. It is approximately 1K into town to the shops and restaurants. The Sea Temple is right on the beach but you cannot swim in it due to jelly fish and crocodiles. There is a sectioned off area on the beach out the front of the Peppers Resort, but from the Sea Temple it is 15 minutes walk. It didn't bother us as we just swam in the pool. We also used the gym one morning and it was pretty good for hotel standards. Stunning grounds, 3 pools, Air con, very comfortable. we had a lovely time here at the sea temple. 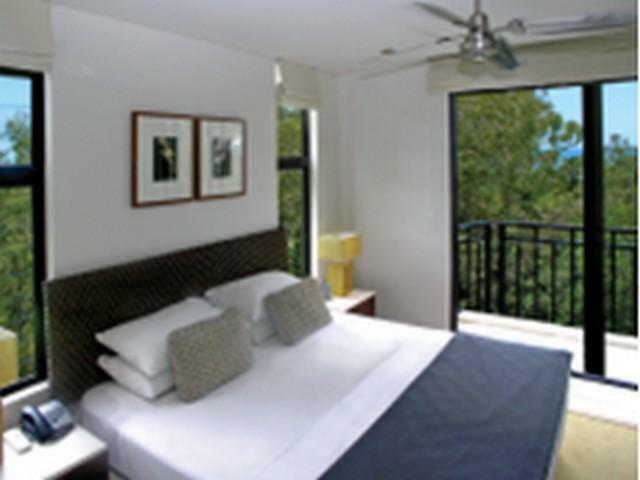 the location of the hotel is within walking distance to the main strip of palm cove. the layout of the hotel is fantastic. very modern, trendy, and also very safe, should you have children. our room was tidy, clean, comfortable. the bed was very comfortable. the shower and jacuzzi were a delight. we were told that there was a fault with the jacuzzi and that maintenance would fix the problem, but we never noticed the fault! the air con in the room was a must as it is so humid in far north queensland. we had hired a car and there was ample parking in the car park. although we didn't try it out, there was a lovely restaurant down stairs. the gym was small and limited to what you can do for exercise, but still good enough to work off the lovely food we had consumed!